This bathroom is a haven for relaxation; the warm lighting, the dark wood fixtures, and the DITRA-HEAT-DUO floor warming combine to create the perfect spa-like environment. 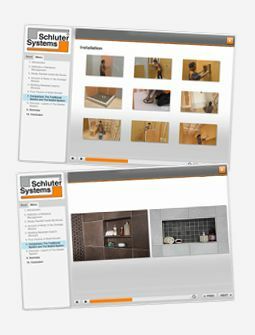 An excellent example of how products from the Schluter®-Shower System can create a beautiful yet functional shower area. This shower includes a custom niche and bench, plus KERDI-DRAIN in stainless steel to compliment the fixtures. The calm, muted color palette and unique tile pattern create a clean, relaxing atmosphere within the shower area. The DITRA-HEAT-DUO floor warming system is used throughout the shower room. The system not only protects the floor covering with its uncoupling and waterproofing properties, but also features a thermal break for energy efficiency, and sound insulation for noise reduction – ideal for apartment living.